The arts scene of the Stevens Point area extends beyond visual and performing arts. We’re showing appreciation today for the area’s best specialty foods. 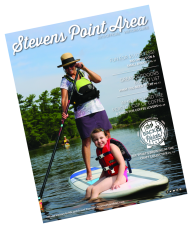 Stevens Point Area Cooperative. You’ll find a host of delicious natural foods at the co-op, including local and organic produce, as well as the area’s largest selection of vitamin, mineral and herbal supplements. Stevens Point Farmers Market. Located on the Mathias Mitchell Public Square in Stevens Point, this farmers market is the longest running in Wisconsin. Mullins Cheese. This family owned-and-operated cheesemaker produces over 50 varieties of cheese, including their famous cheese curds. Ski’s Meat Market. With a passion for providing the highest quality meats and cheeses, Ski’s offers a variety of beef, pork, poultry, seafood and the finest Wisconsin cheeses.